WHEN I first heard that Donald Trump was planning to have most members of his immediate family speak on his behalf at the convention, I took this as further evidence that his campaign was running on a right wing and a prayer. His invitations to speak were rebuffed by a long list of celebrities, joining the unprecedentedly long list of prominent Republicans who had refused to set foot in Trump’s arena. So he decided to do it all himself, with a little help from the only people in the world he could still count on to lavishly praise him: his wife and progeny. It was the desperate act of a world-class narcissist. Melania’s speech last night went well—white Presidential dress, check; cantilevered spanx, check; good immigrant story, check; unreserved praise of the Donald, check, check. But then little Jarrett Hill sent out his Tweet claiming that significant portions of Melania’s speech had been lifted intact from the speech Michelle Obama had given in support of her candidate husband in 2008, and all hell broke loose. It was the Tweet heard round the world. Those who rise by the Tweet shall fall by the Tweet. The media’s sudden obsession with plagiarism was a thing to behold. All suspicions about the underlying illegitimacy of Trump’s successful candidacy were channeled into discussions of a speechwriter’s originality. It was all anyone at the networks was talking about on Tuesday. The obsession was so strong that it carried over to tonight, when The Daily Show tweeted that Donald Junior’s speech was also plagiarized, and one of the speechwriters came forward to say he’d merely repurposed some of his own published writing. But something else happened tonight that is more disturbing and consequential in the long run: the emergence of a possible Trump dynasty. First came 22-year-old Tiffany Trump, daughter of Trump and his second wife Marla Maples. Tiffany is described on her Wikipedia page as “an American heiress, singer, fashion model, and Instagram user.” At the Q, she and her voluminous hair came across as part throaty 1940s femme fatale, and part girl next door, making a credible contribution to the Marilyn Monroe Doctrine. Ivanka cried as her half-sister spoke. Then came Ivanka’s brother, Donald J. Trump, Jr. He took the stage like the groomed scion he is—supremely confident, forceful, and at ease with his privilege. When he made a mistake about “pouring sheetrock and hanging cement,” it didn’t hurt him because he shrugged it off with a perfectly timed and nuanced laugh. His speech was remarkably cogent and persuasive, as if someone had taken his father’s rants and distilled them into sense. His temperament was also refined, as if his father’s bullying hateful speech had been run through a less aggrieved and resentful filter. Donald Junior was good—Kennedy good. 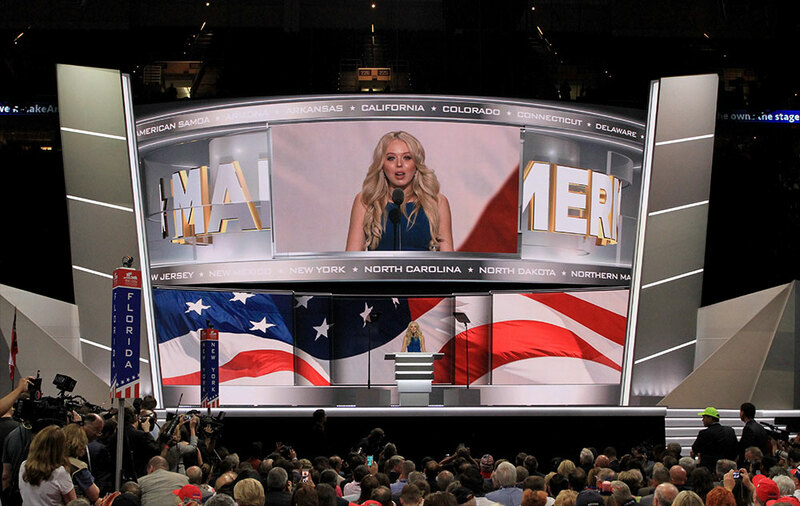 Tonight at the Q, Paul Ryan looked like the past, and Donald J. Trump, Jr. looked like the future. Up to now, I have not been truly afraid of Donald Trump, because I’ve never really believed that he could, finally, be elected. There are just too many negatives for too many voters. But tonight, watching his heir rise, and watching the effect his son’s speech had on the crowd, how their faces and body language were transformed, a cold fear washed over me. *shudder. This is exactly right. Thank you for putting it so eloquently.